Discussion in 'Lexus Lounge' started by krew, Jan 14, 2016. PeterF, Den, Ian Schmidt and 2 others like this. Den, Ian Schmidt, mikeavelli and 3 others like this. My eyes fell off, but orange brake calipers with the F logo would have made it perfect. Alexander Li, PeterF, Ian Schmidt and 2 others like this. meth.ix, PeterF and corradoMR2 like this. Shocking similarities! It's time for us to review the grand turismo vision LF-LC. meth.ix, Dreski, PeterF and 4 others like this. LexusGxNeedsAFacelift and PeterF like this. Every F element looks fine on the LC500 but it doesn't need the side vents at all, they'll spoil the smooth surface of that part. 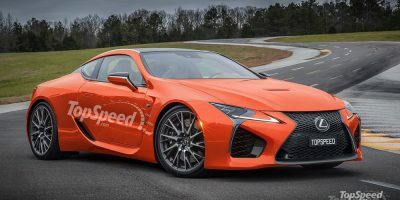 Given that the F-engine is the basic on the LC500, Lexus could have a secret weapon in its arsenal. I'm hoping for a twin-turbo V8 with at least 560hp. The LC F will have 600hp minimum. Hopefully we get the convertible RC also. The LF-CC was the concept of the RC. Of course, the exception is the LFA, but to my eyes, since the LC is offered in "base" with the smooth front fenders, it's not an F without the signature fender vertical scoop on each side. Those are a must! PeterF, Den, Ian Schmidt and 1 other person like this. The vents are also functional for cooling the rear brakes, so I'm cool with them! Alexander Li and PeterF like this. Is nobody thinking that maybe the engine in the LFA project X could be used in the LC F? I think the LC F will probably have a V10, given it's proportions. But it might affect the price, so I'm not too sure. The starting price would be at least $170,000 in that case.